BREAKING NEWS: THE BROTHER SCORES OUTPUT DEAL WITH SCI FI CHANNEL! 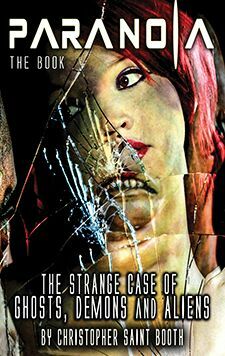 BREAKING NEWS: THE BROTHER SCORES OUTPUT DEAL WITH SCI FI CHANNEL! 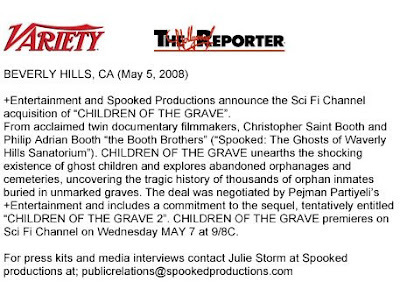 SCI FI CHANNEL HITS #5 CABLE PROGRAM WEDNESDAY NIGHT WITH HELP FROM CHILDREN OF THE GRAVE (SPOOKED TV) MAY 7, 2008. New York, NY May 7, 2008 SCI FI Channel's special event Children Of The Grave, which premiered on Wednesday May 7 from documentary filmmakers The Booth Brothers, scored top ratings to help Sci Fi Channel hit the #5 cable program for a Wednesday night. 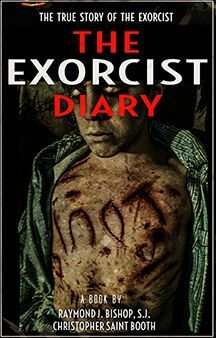 The Wednesday night paranormal special which aired prime time at 9pm brought in a high rating at a total of 1.2 million viewers. This is part 1 of a 2 part special event commitment to Spooked Productions (Spooked TV) and Plus Entertainment of Beverly Hills, CA. Children Of The Grave re-airs again late 2008 and 2009. This is part of a series of shows committed by the channel.